*The term "realization of the Self" refers to the manifestation of the spiritual dimension of the human being. Inspired by the educational system given by Natacha Kolesar; this diagram is an overview of the educational model conceived by Fernande Roy. IDEAL's educational model is a synthesis of the pedagogical aspect of our community life. It is a way to develop individual and collective values and qualities in order to realize our human potential as autonomous and creative individuals contributing to the good of the whole. The educational model in a collective context aims to bring us closer to our ideal of fraternal life where every living being is considered a member of the same family. This model is based on the prism, symbol of unity and synthesis, and the diffraction of white light into seven colors. This symbol is by analogy an organizational template for holistic learning. 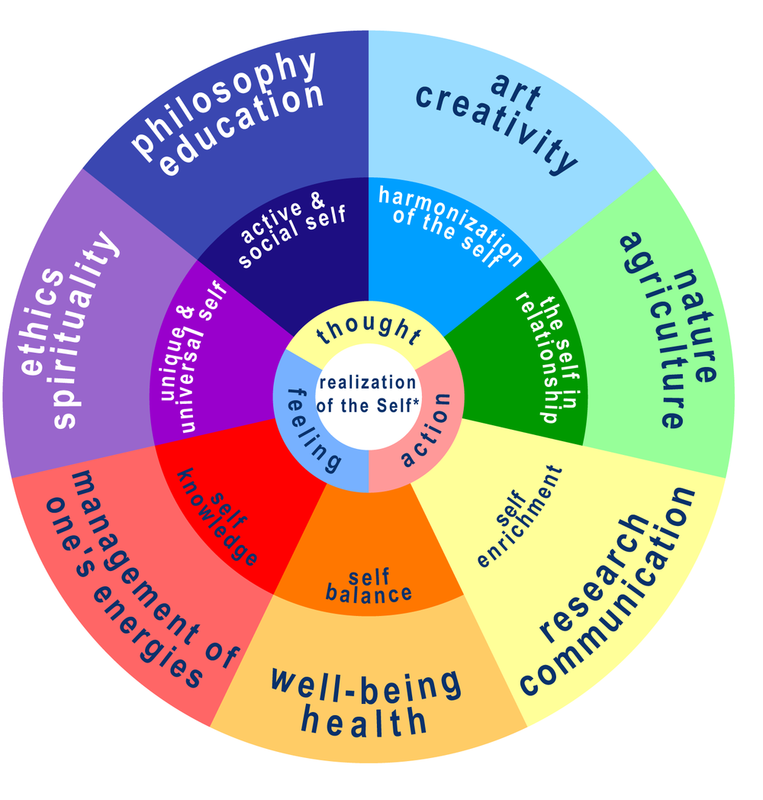 Each color represents a facet of the self expressed through various aspects of human development. For example, the expression of beauty through art and creativity, balance through a holistic understanding of health, or harmonious exchanges with all living things through nature and agriculture. The preferred learning approach is self-education through action and practical experience. • Self-education: an open choice of projects and activities related to individual developmental needs in accord with the collective dynamic. • Learning through action: a form of learning where concrete action, practice and practical applications prevail. • Practical experience: includes a process of reflection and action where thoughts, feelings and behavior are an integral part of the learning process. Self-education implies a free choice of activities in a community life setting in harmony with the group, and also the initiative to engage in research or projects that contribute to the development of the whole community.